Whole Foods had a display of Pluots today. 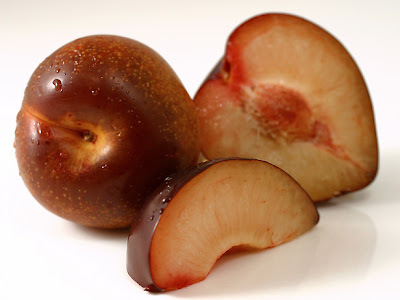 The nice man in the produce section explained that a Pluot is a hybrid between a plum and an apricot. Then he promptly washed one and cut it up for me to taste. Right there in the store. I love Whole Foods. I bought a few of the fancy named fruits (Mango Tango Pluot and Dinosaur Egg Pluot) and enjoyed every bite. Smooth skin of a plum, but the tangy flavor of an apricot. It's hard to beat that.